The pencil cases or pencil pouches of leather or felt – have enough space for, pens, pencils and odds & ends and provide neatness in your bag. 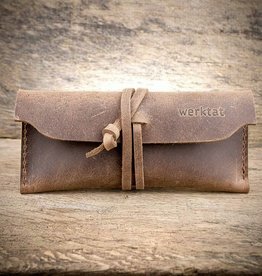 Neat and stylish packaged in the werktat felt and leather pencil cases with a rustic look. Our pencil cases are made by hand for you – piece by piece – in our workshop from the finest wool felt or the best cowhide leather. "Sammelwerk" pencil case leather brown "chocolate"
"Sammelwerk" pencil case leather "maple red"
"Sammelwerk" pencil case leather gray "stone"
"Sammelwerk" pencil case leather "green juice"